One SEO expert reported at SMX Advanced that many of the 15 sites he studied were impacted by Google's Panda update, but they still had more pages indexed by Google than Bing. Alan Bleiweiss, Forensic SEO Consultant, spoke as part of an SMX panel on Google Survival Tips, and some of his evidence suggests that it's easier to be discovered in Google – even in the post-Panda search landscape – than in Bing. With Panda's impact accounted for, there are 10 times more pages indexed by Google than in Bing across the 15 studied sites. 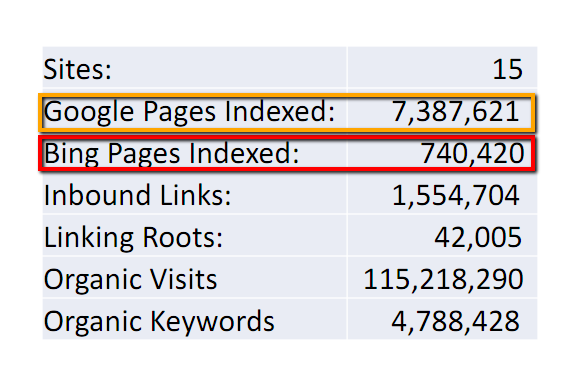 The audited sites have more than 7.3 million collective pages recorded in Google's index. Meanwhile, they total just 740,000 pages indexed by Bing. Does this reveal that Google is better at discovering sites than Bing, or is it a sign that marketers need to better optimize their content for Bing? The search experts at SMX seemed to believe that Google's crawler is currently much better at discovering content than Bing's search bot (undoubtedly part of why Google is still the No. 1 search engine in the market, by ComScore's latest measure). Of course, it wouldn't hurt for businesses to try to make their pages more SEO-friendly for Bing. The search engine is generating a lot of buzz in light of its recent Facebook partnership, and Bing's director of search, Stefan Weitz, made some compelling arguments for social search becoming the future of the industry during his SMX Advanced keynote. Duane Forrester of Bing was also at the conference, and he reminded marketers that content is king when it comes to Bing SEO – and SEO across other search portals, for that matter.